When you use a pistol or a handgun you must be particular about the various parts of the device. No matter how good a shooter you are but if the pistol is not up to the mark you might end up missing your targets. And on the other hand, if you pick the best accessories suiting your gun there is no reason for you to fail. Sights are one such necessary accessory that enhances your aiming immensely. Best flip up sights, when combined with your amazing aiming skills can create magic during your shooting sessions. Therefore it is necessary for you to know the product and its use to incorporate the same in your pistol. 1 What Are Pistol Sights? Pistol sights are devices used to aim your target with precision. It is extremely important to aim your target well to get your shot correct. With the correct sight fixed in your favorite pistol, you can target straight away for the bull’s eye. The handguns, in general, are provided with two sights, a front site located in the front end of the gun closer to the barrel and a rear sight located closer to the sniper. Pistol sight may either be fixed or adjustable. Fixed gun sights are non-movable sights. You cannot change or replace them with the upgraded ones available in the market. 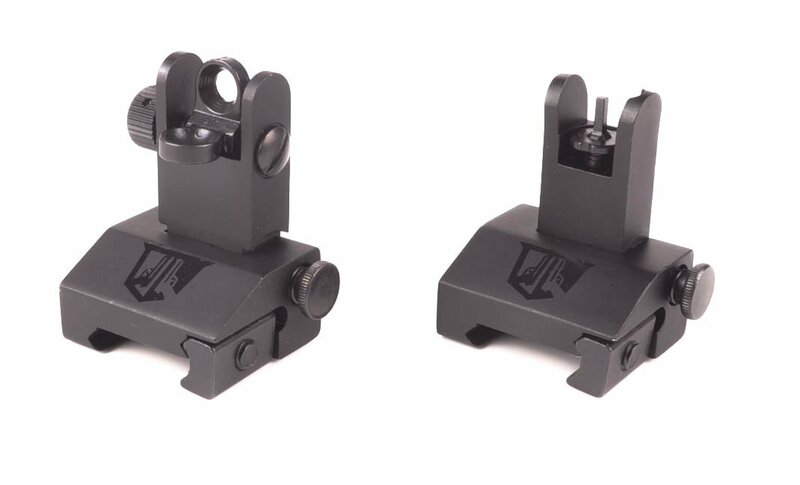 The fixed sights are designed in such a way that they are good to be used while shooting for a particular distance and for a fixed burden of ammunition. Adjustable sights, on the other hand, are movable. They make up for elevation as well as windage in most of the pistols. The wind blowing affects the projection of the bullet and according to the same the sight can be adjusted and fixed. Elevation adjustment refers to altering the sight up and down. The front sight is mostly adjustable to rectify elevation errors. The snipers who involve in target shooting generally are recommended to opt for adjustable sights. It helps them to load certain ammunition and then set the sight to aim the target. The three dot sights are available in several standards and are even available to be used as a day or night sights. The daytime dot sights have white dots painted on them, one dot on the front sight and the remaining two on the rear sight. The three dot sights impart a much clear aim to the sniper. The manufacturers generally make the front single dot a little bigger than the other two rear view dots. Sights made up of fiber optics are good to be used in dim or low light but not for complete dark areas. A fiberglass or rod is inserted into the gun sight made up of metal. These rods made up of fiber trap the light and let it travel to the tube’s end. Owing to the reflective properties of fiber the sight tube gets lighted up. Night sights are used in situations involving complete darkness. They completely glow in dark situations. The night sight manufacturing companies use tritium as the glowing material. Tritium is an isotope of hydrogen that is radioactive in nature. It keeps glowing in darkness without the need of a charging source. As a result, tritium and phosphor are mixed together and inserted into the pistol sight. Once inserted, tritium gives a glowing life of around 12 years. These sights are manufactured in the USA and are made up of polymer which makes it light in weight and resistant. These sights impart windage adjustments. These sights come with two rear view apertures with one bigger than the other. You will just have to flip it according to your convenience and use the one required. These flip up sights can be adjusted left or right to fix it for windage. These sights can even be adjusted up or down to manage elevation. The material used to manufacture these sights is extremely light polymers which are durable and sturdy at the same time. These sights fit firmly unlike other sights which tend to become loose with time. These flip up sights can be used with a wide range of handguns. Hence, if you have these in your toolbox you need not worry about purchasing any other sight. To flip the sight up you just need to press a red button provided which makes the usage of the gun sight hassle free and smooth. These sights do not work in the dark. The left and right windage adjustments are not very smooth to operate. This aluminum flip-up sights are extremely light in weight and imparts windage as well as elevation adjustments. 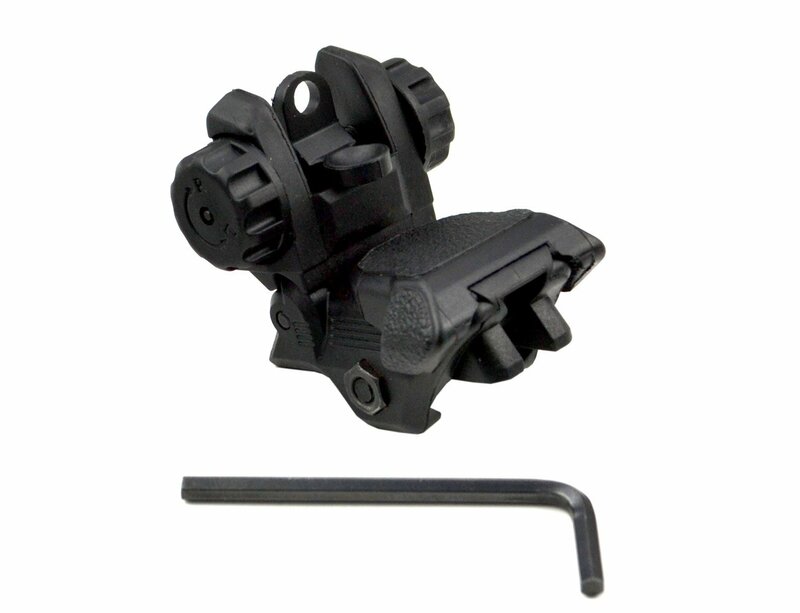 These are multi-use sights that can be used with a wide range of pistols including airsoft guns as well as real rifles. A button is used to operate the gun sight that needs a little oiling for perfect working. These are made up of aluminum that makes light of weight which in turn keeps the gun light too. Can be flipped up and down to adjust it for elevation. The rear sight imparts windage adjustment by moving them right and left. When the flip is turned down the length is around 2 inches for the front sight and 2.25 inches for the rear sight which makes it easily accommodated in any carry bag. You can use these for airsoft guns as well as real rifles. These sights come with a button that can be used to flip the sights up and down. To adjust the front sight there is no tool included with the product. An external wrench has to be used to fix the same. The button provided to use the sight flip to flip up and down requires oiling time and again as it tends to get stuck sometimes. 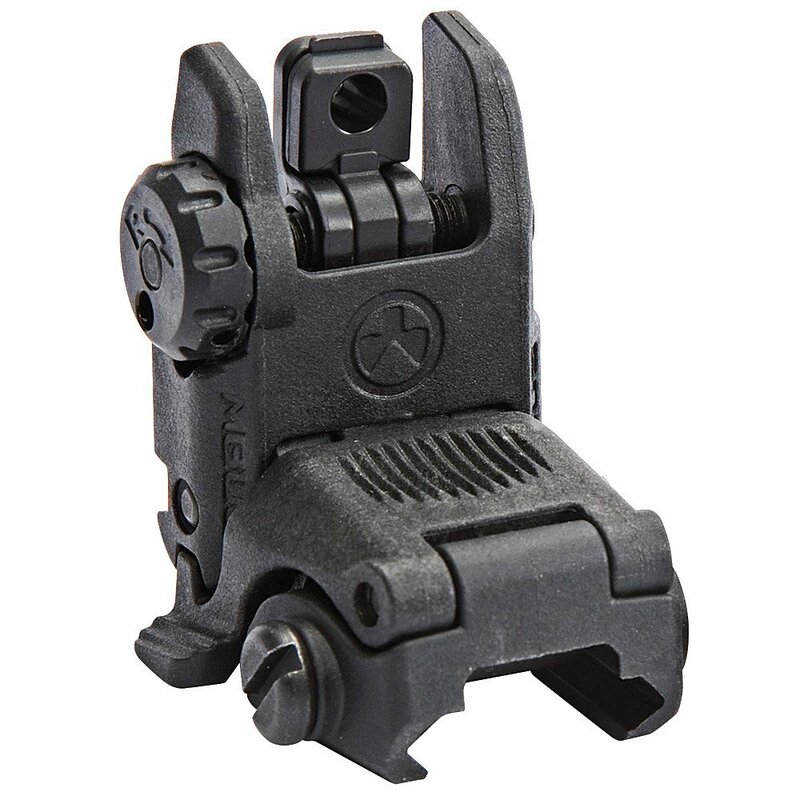 These polymers flip-up sights are operated with a button and offer elevation as well as windage adjustments. The button provided to operate the flip is sturdy and can be used with a hand covered with gloves. The slide is smooth while moving and firmly fixes to the pistol and helps aim the target with ease. To operate the flip with ease the sight is provided with a button. You can slide the button forward to allow the sight to flip open. The button is strong and durable and you can even operate it while having gloves on. These flip up sights can be used with rifle scopes at the same time causing no hindrance. These sights are made up of polymer and are extremely light in weight. Hence all the used need to concentrate on is the target. It perfectly fits on the pistol’s rail and is smooth to slide and use. These sights work for a wind range of handguns. Therefore, you need not purchase different sights for your different rifles. The button provided to operate the gun sight and flip it tends to get stuck at times. Though regular lubrication can keep it working smoothly. Pistol sights are available in varying forms that combine with your guns to impart a precise aiming. It is recommended that you know the device well before investing your money in buying the same. These pistol sights are available to serve different purposes and you should well know the uses before you pick one.